An RBI panel is also considering a government request to transfer more of the central bank’s excess capital to the state. An increase would help plug a widening budget deficit, allowing Prime Minister Narendra Modi to fund billions of rupees in spending to rural workers, a key voting bloc . Lower food prices have put a lid on inflation — and even though price gains accelerated to 2.6 percent in February from 2 percent in January, they remain well below the RBI’s medium-term target of 4 percent. 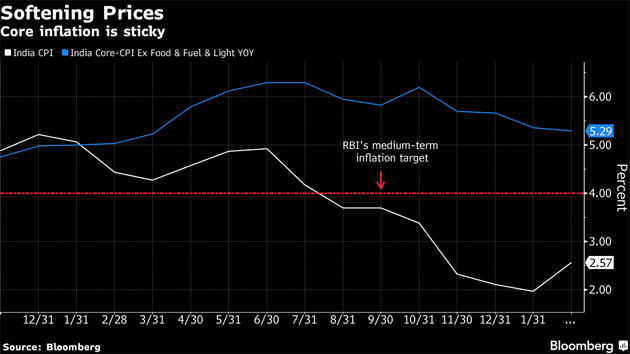 The RBI expects inflation to stay below that threshold until the end of the year. Benign inflation has brought into sharp focus Inia’s high real rates of interest, which economists say can hold back investment growth in the economy. Private consumption has already taken a beating on the back of a crisis in the shadow banking sector, and recent high-frequency data point to a bumpy ride for the economy ahead. 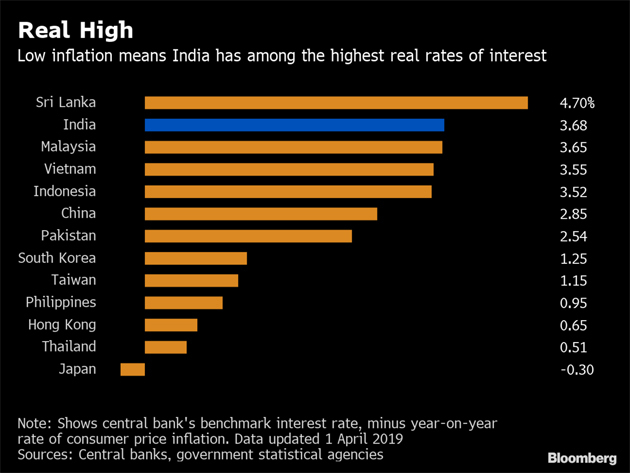 Our view is that the RBI — now on a data-dependent path — will need to lower rates further than the consensus expects. We expect the central bank to deliver two more 25 basis point reductions — the first in April.– Abhishek Gupta, India economistClick here to read the report . “The rapid exemption of state-run banks from the prompt corrective action suggests that Das risks swinging the pendulum too far to the other side,” said Priyanka Kishore, head of India and Southeast Asia research at Oxford Economics Ltd. in Singapore .